Startup Journey Emotional Roller Coaster: Can You Handle the Stress? You’ve had a great idea for a new product or service and have decided to act upon it by forming a new startup company. You’ve enlisted a couple of co-founders with complementary skills, gotten some seed capital and built a prototype or MVP. How exhilarating! Also physically exhausting, emotionally draining and potentially straining on the important relationships in your personal life. 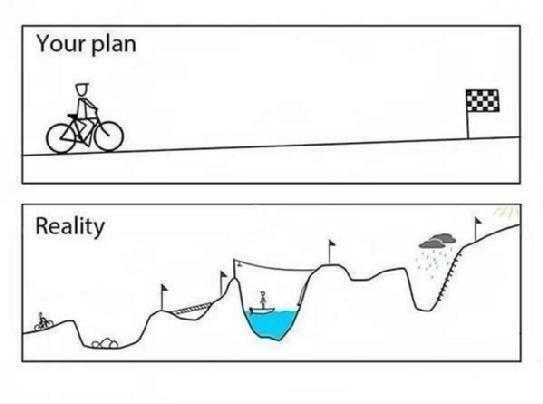 The startup journey is truly the proverbial roller-coaster ride. Sometimes you’ve reached a breakthrough to your next milestone, and sometimes an assumption you made along the way turns out to not be true and you’ve taken two steps back. Can you handle the emotional ups-and-downs that are a core part of the startup journey experience? This is a key question to ask yourself – and ANSWER – BEFORE you get very far into your journey. How well you are able to handle those up-and-downs may play a key role in your success – or failure. Startup stress really falls heavily on the CEO and on the other founders. These are the folks who have usually taken the biggest leap of faith in attempting to start up a company from out of the dust. In many, if not most circumstances, they’ve bet a great deal on this new idea at the outset. Often times this means quitting a good job, forgoing a salary for some substantial period of time and in extreme cases maxing out their credit cards or taking a second mortgage on their home. Add all of these potential stressors add up and it’s a prescription for significant emotional distress. But the stress doesn’t end there. When the folks at the top are feeling the heat, tension usually fills the air of the whole company. Meetings get a little tenser, assignment timeframes get a little shorter, budgetary requests are given greater scrutiny. Everyone feels it, down to the entry level employees. It’s ok for the entire organization to know what’s at stake and what’s going on at a high level. Honesty and transparency are important. But putting everyone on the roller coaster with you is almost always counterproductive. Remember, you’re being watched – everyone takes cues from the top. So do your best to reduce your own stress, which everyone in the company will almost certainly sense and should put them at ease, more able to focus on the tasks at hand. Try to emphasize the positive events to the broader organization whenever possible. Downtime may be scarce, but finding a way to get some is critical to allow you to recharge your batteries and maintain perspective in decision-making. Otherwise you tend to get caught in “tunnel-vision” from intensive focusing for extended periods, damaging your ability to think critically. Above all, learn to enjoy the journey, even while still needing to focus on reaching the end goal. If all you can see is the end goal, you will go crazy! If you allow yourself to see and experience it, there is much joy and humor along the way. It’s very important to hire carefully in the early days of the startup journey for your company. You only have so many resources, and you need to make every dollar and therefore every new hire count. As a result, there is often a tendency to look for a very close fit in terms of functional skills and experience. Which is a good thing to do; I wouldn’t argue that. But in my opinion it is equally important to evaluate personality & culture fit. How well they will deal with the high levels of stress found in any startup, as well as will they be able to fit in and work with the other team members without undo friction. It does no good to hire the candidate with the perfect skill set if they are buckling under the pressure of producing. In a startup, unlike any big company, there is usually nowhere to hide if you’re not executing. For some people, this represents a level of scrutiny that they just aren’t comfortable with. The stress of meeting deadlines in an environment that is under-staffed, under-resourced and under extreme time-pressure as the company races to meet it’s goals before it runs out of money or misses its market window, is overwhelming to many. To others, this stress is challenging but just sharpens their focus. You need to find the folks that fit into the latter category and hire them. Prior startup experience helps; it’s easier the second time around. You can be told about it, but it’s hard to truly understand what a startup is all about until you’ve actually done one. So if the founders and senior management team are startup veterans, it will be much easier for them to maintain the necessary even keel over the long haul. Not everyone is cut out for life in the startup journey. You may find someone who “on paper” fits perfectly what you’re looking for in a new hire from a skills and experience perspective. But if they’ve only worked in very large, stable organizations, be very careful in hiring them. I’m not saying don’t – many folks come out of large companies and thrive in the startup world. I did! But I know many folks that came out of the same or similar organizations, and either failed miserably or hated life in a startup company. So are you cut out for the startup life? Are your founders and employees? I’ve listed some thing to consider before embarking on the startup journey, as well as some best practices to enhance the odds for startup organizational success. I’m sure many of you could add some things to the list. Post a comment to add to the discussion.